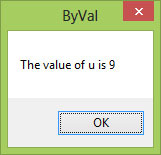 In this Lesson, we shall learn how to create a Function in Visual Basic 2015. A function is similar to a sub procedure but there is one major difference, a function returns a value whilst a sub procedure does not.In Visual Basic 2015, there are two types of functions, the built-in functions and the functions created by the programmers. We have indeed learned some built-in functions that are used to manipulate strings in Lesson 12. Functions created by the programmer are also known as user-defined functions. The keyword Public indicates that the function is applicable to the whole project and the keyword Private indicates that the function is only applicable to a certain module or procedure. Argument is a parameter that can pass a value back to the function.There is no limit to the number of arguments you can put in. 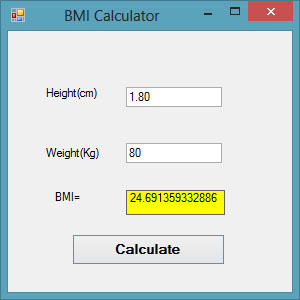 This BMI calculator is a Visual Basic 2015 program that can calculate the body mass index of a person based on his or her body weight in kilogram and the body height in meter. BMI can be calculated using the formula weight/( height )2, where weight is measured in kg and height in meter. For example, let's say you deposit $1000 in a bank and the bank is paying you 5% compound interest annually. 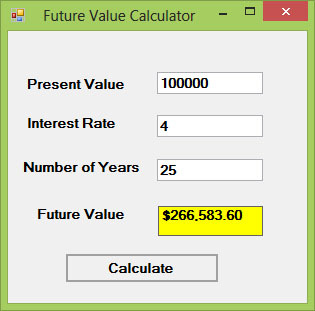 After the first year, you will earn an interest of $1000x0.05=$50. The new principal will be $1000+$1000x0.05=$1000(1+0.05)=$1000(1.05)=$1050. After the second year, the new principal is $1000(1.05)x1.05=$1000(1.05)2 =$1102.50. This new principal is called the future value.